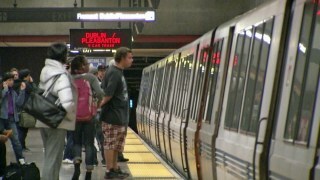 BART riders wait to board a train in this file image. An equipment problem on the tracks at the Embarcadero Station in San Francisco Tuesday morning caused a 20-minute delay on BART for many riders. BART tweeted about the problems at 5:35 a.m. when a switching problem on the track at Embarcadero and an earlier mechanical issue with a train started tying up the morning commute. Crews were working to fix the problem and had trains moving throughout the system by 6:30 a.m., but commuters were warned to expect residual delays. On Friday, BART also reported a major systemwide delay, following another delay two days prior to that after a train hit a tree on the tracks.